Location: From the intersection of Hwy 45 and Hwy 70 on the east side of Eagle River, continue east on Hwy 70 about 9 miles to Forest Road 2178. Turn south on FR 2178 and continue about 3 miles to Forest Road 2181. Turn south on FR 2181 and continue about 5 miles to the campground. Park at the Franklin Lake Nature Trail parking lot and follow the trail approximately .5 mile to the Hidden Lakes trailhead. If you take the entire 13-mile loop, the trail ends at the Franklin Lake boat ramp. This long-distance trail provides the chance for an overnight campout by a small remote lake. 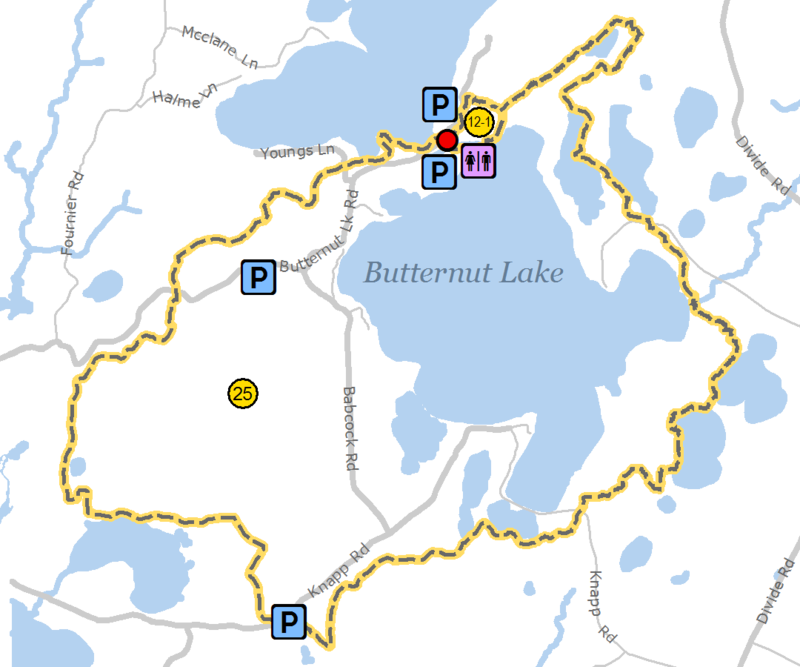 Starting midway on the Franklin Nature Trail, the Hidden Lakes Trail loops south around Butternut Lake, passing several small lakes with scenic vistas and a remarkable stand of old hemlock trees, then back west and north to the Franklin Lake Campground. Several sections of the trail follow other trails and old roads so be sure to have a map handy. *Pets are not allowed on groomed ski trails.